I wanted to give the Makeover Monday Community a chance to have some fun this week, so I provided them with every American Express transaction of mine from 2016. There were some really interesting vizzes and a lot that could use some more work. I made notes throughout the week about my observations. Knowing your audience is absolutely critical when doing an analytic project of simply creating a story with data. On most weeks the audience for Makeover Monday is a bit vague, however, this week the audience was very clear. It was me. Yet not a single person the entire week asked me what I was hoping to learn, what my objectives were, what I wanted to see. If you know your audience, it’s your duty to ask them questions to create a better deliverable. This data is pretty personal, it’s my credit card spending data. 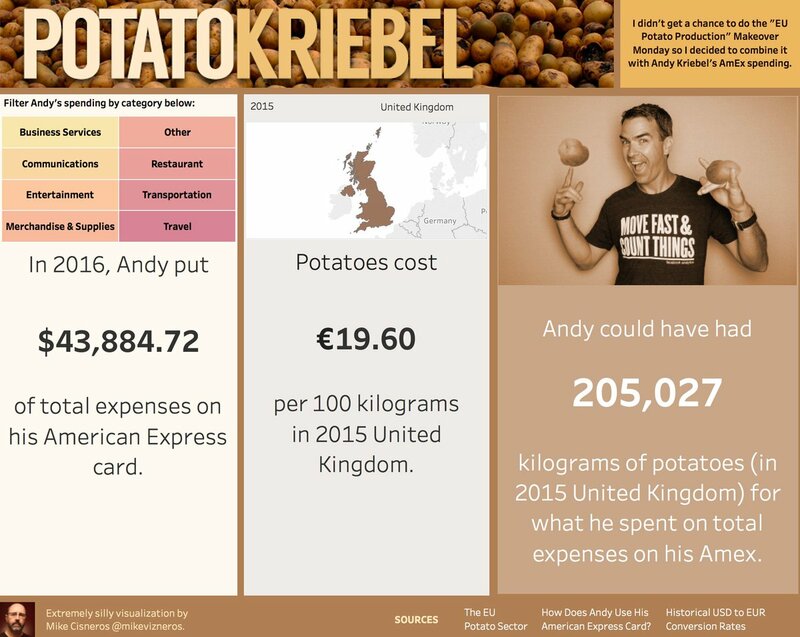 Did anyone put themselves in my shoes and think about how they would like to see their own spending data visualised? Maybe they use a mobile app from their own bank and don’t like certain aspects. How would they improve on their own banking data visualisation experience as a customer? Why didn’t you show something like that? Did anyone ask what my favorite color is? Nope. My favorite font? Nope. There were a million questions people could have asked, but chose not to. I’m curious to know why. Going forward, I’d like to encourage everyone to think about the audience. Think about the aim of the project. A few people asked about specific data points, particularly my car purchase in December. Did anyone ask if the data was complete? That is, did it represent ALL of my purchasing? 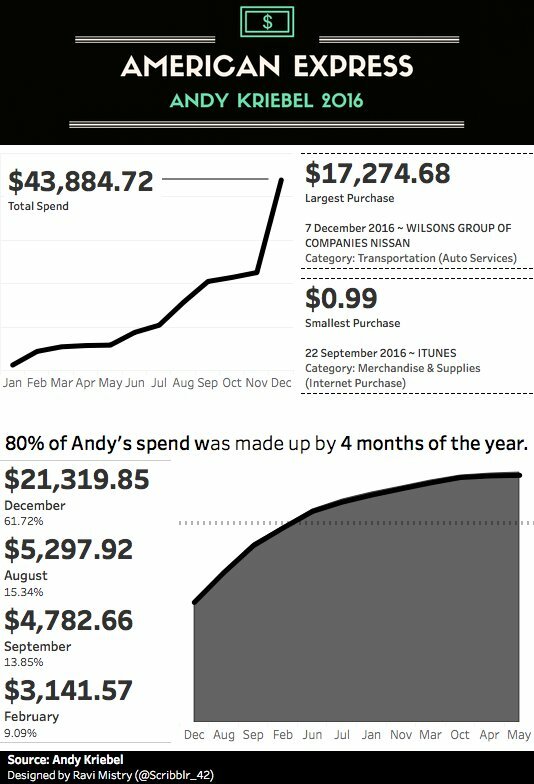 No it didn’t, yet some people created graphics that implied that this represented all of my spending. The data was my AMEX spending; that’s it. People could have easily ask if there are certain circumstances when I use it vs. my bank card. This would have helped create a more meaningful graphic. People made really bad/wrong assumptions which they didn’t substantiate with data. These implied things about me that are simply not true. Some orange-faced man might call that FAKE NEWS! Again, this goes back to knowing the audience and asking your audience questions. Don’t make assumptions you can’t back up. Once you know the audience, you have a clear aim for your project and you have a firm grip on the data, it’s time for the graphic. If you build the graphic before you know any of the other components, you’re doomed to fail. After you create your graphic, ask yourself “So what?” If you can’t answer that, keep iterating. Show your work to others. Show it to someone that knows nothing about the project or about data visualisation. Ask them what they see. If they don’t respond with what you were expecting, then you need to iterate. How do I do this? It’s really pretty simple. I show my early prototypes to my wife or kids. I ask them to tell me what the graphic is telling them. I sent lots of vizzes to Eva for feedback. I post internally to The Information Lab. I want honest feedback and I know they’ll give it to me. Packed bubbles and treemaps – These are horrible charts for making comparisons. I really, really dislike them. This goes back to knowing your audience and it also is about understanding the fundamentals of how humans read charts. When you create a packed bubbles and treemaps, ask yourself what the fifth highest item is. If it takes more than two seconds, it took too long. Go with bar charts. Keep it simple. Why create a map? If the data set includes geographical data, people will create a map. Whether it’s needed or not, people will create them. Tableau makes maps simple and beautiful. Yet I didn’t see any maps this week that added any value to the story. Just because you have geographical fields, it doesn’t mean you HAVE TO create a map. Only use maps when they add value. Credits for Icons and Images – I’m as guilty as the next person for not remembering to always credit sources for icons and images. We all need to be better at this. Credit those that created the content you are using. They deserve the recognition. Keep it simple! Even with the chance to keep it simple, people overcomplicate the visualisations. You don’t always need to build a dashboard with 2x2 charts, filters, parameters and five legends. Think about what you can take OUT of your visualisations, not what more you can add. Focus on a story. If there are elements of your viz that don’t support the story, take them out. Simplify, simplify, simplify. Images of me – Did including my image improve any of the visualisation? I’d argue no. I know who I am. I don’t need you to show me that. Go back to lesson 1. I’m the audience; I don’t need to see a picture of me. And when you do use them, please be appropriate. Think about if the picture you’ve created was you. Would you like it? One of the many great positives from this week was how receptive so many people have been to feedback from Eva and me. We can be a bit direct at times (especially me), but we hope that you understand we do it with the intent to help you improve. Dave Kirk iterated like crazy this week, constantly refining and seeking feedback. There’s a massive community out there wanting to help. Just ask. Robert Reif and Staticum are two more great examples of people willing to receive feedback and learn from it. 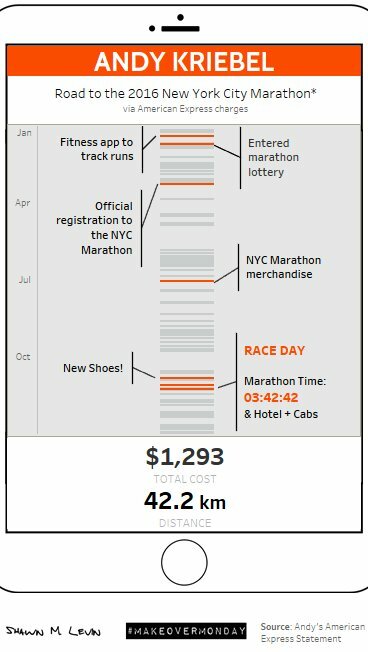 One of my favorite things about using Tableau is how quickly I can iterate, try ideas, explore the data, and make changes based on feedback. Think about the development squiggle by Damien Newman. It’s been really fun this year watching everyone learn and grow. Let’s keep it going. I hope my feedback helps. And with that, here are a few of my favorites from week 9. The font colors on the backgrounds work perfectly, making them really easy to read. The big total number is nice, but the image in the background is not really necessary and doesn’t add any value. The transaction list is really well designed. I like the bigger number for the amount spent and the detail that goes along with it. The expense by category section is well thought out. I like the light bar chart and the big numbers for the category totals. Overall, the design feels like something that any bank could take and use right away.